PAUL BISHOP ~ WRITER: NEW TAKE THE MONEY AND RUN SNEAK PREVIEW ON EXTRA! 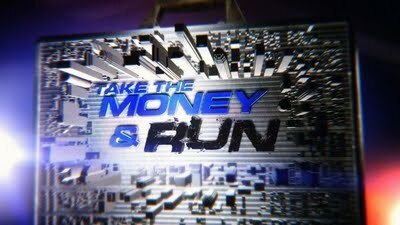 NEW TAKE THE MONEY AND RUN SNEAK PREVIEW ON EXTRA! PER EXTRA.COM . . .
From the producers of "The Amazing Race" and "CSI" comes an entirely new heart-stopping competition show, "Take the Money and Run." The series combines elements of an edge-of-your-seat spy thriller with the excitement of rooting for real people, pitting investigative professionals vs. everyday people trying to win a weekly $100,000 prize. In each episode, two players as a team are given one hour to hide a briefcase containing $100,000. Once that time is up, they're taken into custody by local police detectives and brought to investigative headquarters. Over the next 48 hours, the detectives will work with professional interrogators -- Detective/best-selling author Paul Bishop and Deputy District Attorney/best-selling author Mary Hanlon Stone -- to combine efforts and determine the location of the briefcase. "Take the Money and Run" premieres Tuesday, August 2 at 9:00 PM on ABC.